Rice Medley is rated 4.0 out of 5 by 5. Rated 5 out of 5 by subieQ from The Best Side Dish Ever This is my favorite side dish. Delicious, quick, and easy to adapt with recipes. Yum! Rated 5 out of 5 by scoutmom from My favorite the rice always comes out perfect and I love the addition of veggies. it is a great way to get my kid to eat a few vegetables without complaining! Rated 5 out of 5 by Brett from My favorite rice My mother used to make this with lemon chicken when I was younger. The stores around me stopped carrying it. I never quit looking though. I finally found it on Amazon, and I now buy this rice by the case. I sometimes add a whole juiced lemon. Perfect with fish or chicken. 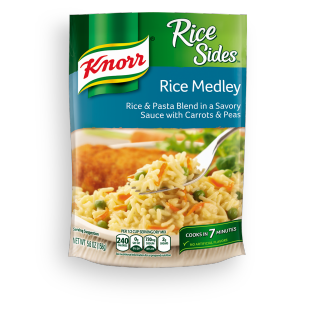 Rated 1 out of 5 by paulo from Knorr forgot the medley After recently purchasing Knorr's Rice Sides Rice Medley, we opened the package to enjoy a side for supper and found NO carrots and peas with the savory sauce as advertised on the package. Consequently, the next stop was the garbage can. Buyer beware.